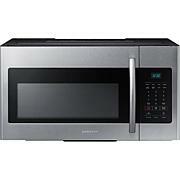 The Samsung ME16H702SEW 1.6 Cu. 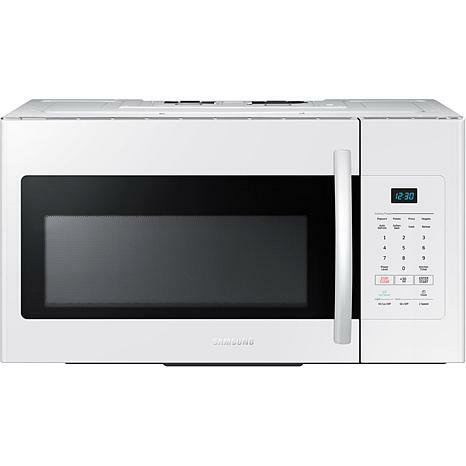 Ft. Over-the-Range Microwave, in white, combines 1000W of cooking power with an impressive 300 CFM ventilation system to create the perfect OTR microwave. The one-piece door design, with its aluminum handle and side control panel, provides a seamless modern look that blends perfectly into any kitchen. The 300 CFM ventilation system quickly, quietly, and efficiently eliminates food odors while the included cooktop lighting system ensures easy viewing of cooking foods. Options including two-stage programmable cooking, 10 power levels, auto defrost/reheat, and auto cook make creating the perfect meal a cinch. Additional features include a kitchen timer, vent fan control, and a charcoal/grease filter. 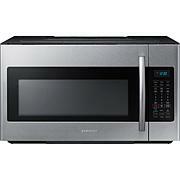 This is a wonderful microwave. Love the built in feature. Installation went very smoothly. My husband was able to install in about a half an hour. The microwave is the best I have ever owned. The defrost feature actually works well and defrosted very evenly. I love it! Easy to install by yourself, love it, very nice for the price. 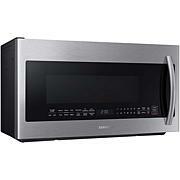 Received with dents all over this microwave but didn't won't to wait for a new one bit it worked just fine.